Priyanka stayed at the temple for nearly two hours and offered prayers at the shrine which is revered by Kashmiri Pandits. Priyanka Gandhi later visited the Swami Lakhsmanjoo Ashram along the banks of Dal Lake in Nishat area of the city. 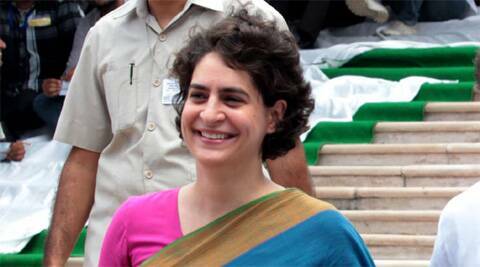 Priyanka Gandhi made a low-key visit to Kashmir during which she offered prayers at the Mata Kheer Bhawani shrine in Ganderbal district, officials said on Friday. The daughter of Congress President Sonia Gandhi arrived by an early morning flight yesterday and drove straight to the shrine at Tulmulla in north Kashmir’s Ganderbal district, the officials said. She later visited the Swami Lakhsmanjoo Ashram along the banks of Dal Lake in Nishat area of the city. “She was there for two hours before she left for the airport to return to Delhi,” the officials said. Although adequate security arrangements were made for Priyanka’s visit, very few officers were aware about the identity of the high-profile visitor, they said. Priyanka made a similar visit to Kashmir last year.